The Neroli Blanc Collection from French niche perfumery Au Pays de la Fleur d'Oranger was one of my happy discoveries of early 2014: it's a trio of well-made, reasonably priced interpretations of neroli and orange blossom, and my samples brightened a few long winter days for me. 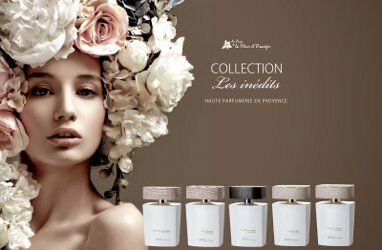 This fall, I've been exploring the company's Collection Les Inédits, a range of more complex fragrances. My two favorites are Rose Irisée and Violette Sacrée, both developed by perfumer Jean Claude Gigadot and released in spring 2014. With Rose Irisée and Violette Sacrée, Au Pays de la Fleur d'Oranger presents two classical perfumery themes reinterpreted with a modern sensibility — and you know I can never resist that kind of promise. Rose Irisée is described as "unapologetically feminine with a nod to the great vintage perfumes of the past," and it includes notes of bergamot, orange and wormwood; almond, rose, orris and ylang-ylang; and cedarwood, musk, patchouli, vanilla and sandalwood. Rose Irisée is more iris than rose: its dominant note, to my nose, is a woody-sweet iris that reminds me of the dearly departed L'Artisan Orchidée Blanche or the more recent Terry de Gunzburg Ombre Mercure. The cedar brings out the iris's dryness, and the hints of bitter green may come from the wormwood; the flower's sweet (but not sugary!) aspect is supported by the vanilla and sandalwood. Rose Irisée isn't nearly as conventionally feminine as I expected due to all the woods and the greenness; it's not as rose-y as I would have guessed from the name, either. The rose and almond emerge much later, in a very quiet dry down. It's a sophisticated yet understated scent. Violette Sacrée, the second fragrance from this range that I've been enjoying, is "complex and textured," with a composition that includes notes of bergamot, violet and violet leaves; rose, jasmine, orange blossom and lily of the valley; cedar, vetiver, musk and wood accord. It's meant to evoke "wild violets bloom[ing] under a verdant canopy." If you like Balenciaga Paris or Sonoma Scent Studio's Voile de Violette and Wood Violet, then Violette Sacrée will probably appeal to you as well. Certain notes in its composition stand out more than others; to my nose, it's like a three-part twist of candied violet, dusky-earthy vetiver and honeyed orange blossom all braided together. Violette Sacrée and Rose Irisée both incorporate traditional themes without actually smelling like vintage perfumes, which means they've delivered on their promise. Both have very good longevity, and either one could be worn by an open-minded man as well as a woman. The price is right, too — much less than you might pay for an iris or violet fragrance from other niche brands. All in all, very nicely done, and worth seeking out. Au Pays de la Fleur d'Oranger Rose Irisée and Violette Sacrée are available as 100 ml Eau de Parfum ($125) through Beautyhabit, Indigo Perfumery and Twisted Lily. For additional information, visit the Au Pays de la Fleur d'Oranger website. J: Thanks for reviewing this line…I’ve wanted to try their fragrances and not a darn spot in Seattle has them. Time for a sample order I guess. From the ones you’ve smelled so far…what are your top 3? So far, these two and the Neroli Blanc Intense EDP! but I liked the other Neroli scents, too. I haven’t tried the fig and the tuberose and the lavender yet, but since I’m not generally a big fig fan, that one probably wouldn’t have made my personal top 3 in any case! When I received my Moon Bloom travel spray, a sample of Violette Sacree was included, and it is nice (SSS Voile de Violette was a bit intense for me). Agree it’s nicely done, and now would like to sample Jasmin Reve and Tubereuse Rosee. I’m always happy to come across pleasing, wearable florals for grown-up women… especially when they don’t cost $350 or whatever! I do love a candied violet note… but it’s not *too* much, thanks to the vetiver!! I have been curious about this perfumery for a while now. I like the bottles with the stained wooden tops, the dusky coloring of the ad, and the pricepoint! The Rose Irisee sounds especially promising Thanks for the helpful review!